OK, OK... 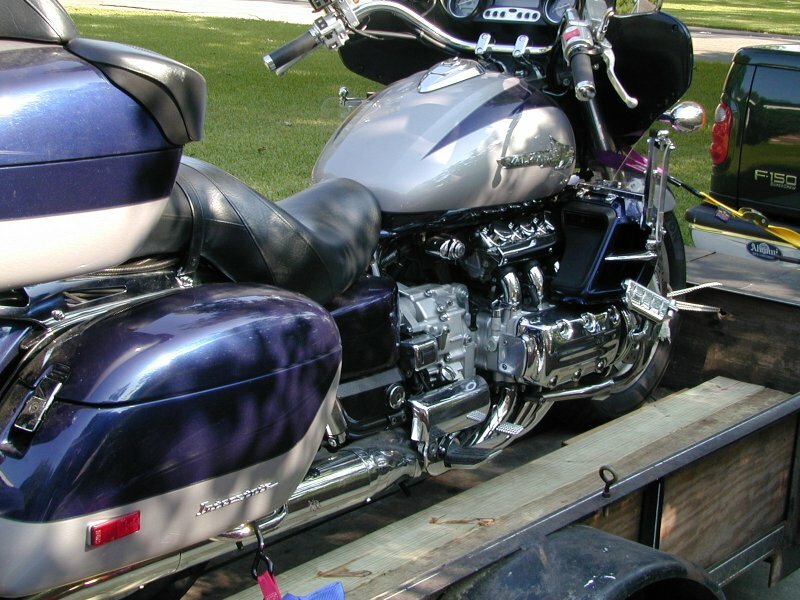 I know many of you bikers will pound on me for even considering trailering my Valkyrie anywhere. But, it makes a lot of sense, if you live in Houston and want to spend some quality time with the SO in Colorado. We get to have a great run up to Colorado in our truck, make better time, have good conversation, then when in Colorado, plenty of time to really enjoy motorcycle riding in the mountains. And, as you can see in the photos, I also trailer my motorcycle trailer... the department of redundancy department, no? use nylon loops around the lower triple tree. They even work on the I/S with a fairing. Available at any motorcycle shop. Do not use the handle bars to tie down. You want to be as near to the center of the bike as possible. screw down 2 x 4's onto the trailer floor, one on each side of the tires. The purpose of the 2 x 4's is to prevent side to side motion of the wheels and tires. when tying down the front forks of the Valk, make sure they are compressed about 1 1/2 to 2 inches. Anything less than this and you risk the possibility of having the front tire jump out of the 2 x 4 rails, which would cause the bike to fall. Make sure your front tie downs pull towards towards the front as well as to the sides. Similarly, the rear tie downs should pull to the back in order to minimize fore/aft movement. Keep the kickstand up. You want to trailer with the bike upright. Never tie down with the bike on the kickstand. The forces are sufficient to bend the kickstand mount. there are at least a couple of places to tie down at the back. You can use the bag guards on a Valk with saddlebags. Or, for any model, remove the seat, attach the S hooks to the frame crossmember and make sure they are forward of the cross member. Replace the seat. (this is obvious when you actually do it). I tie the front wheel to the frame to minimize left/right motion. A lot of people say you need to use ratchet tie downs. I disagree. The clamp type tie downs work just fine. When I lost my motorcycle in a wreck, it was interesting to note that the nylon straps broke when the bike was thrown from the trailer, but the latches were exactly where I left them. Just don't buy cheap ones... they need a minimum of 1200 lbs max load each. Be sure your gas petcock is off. The vibration of riding on a trailer can cause a cylinder to fill with gas, creating a very bad situation. Make sure your bike is in gear. If you are using an open utility trailer, a piece of plywood across the front will greatly reduce the number of dings on your bike from gravel thrown up by the tow vehicle. Just about mandatory for gravel roads. I know. I towed with the rig below across 40 miles of gravel road and got several dings in my fairing. Tying down the front end to compress the forks is hard on any motorcycle. It places a lot of pressure on the fork seals for an extended time. 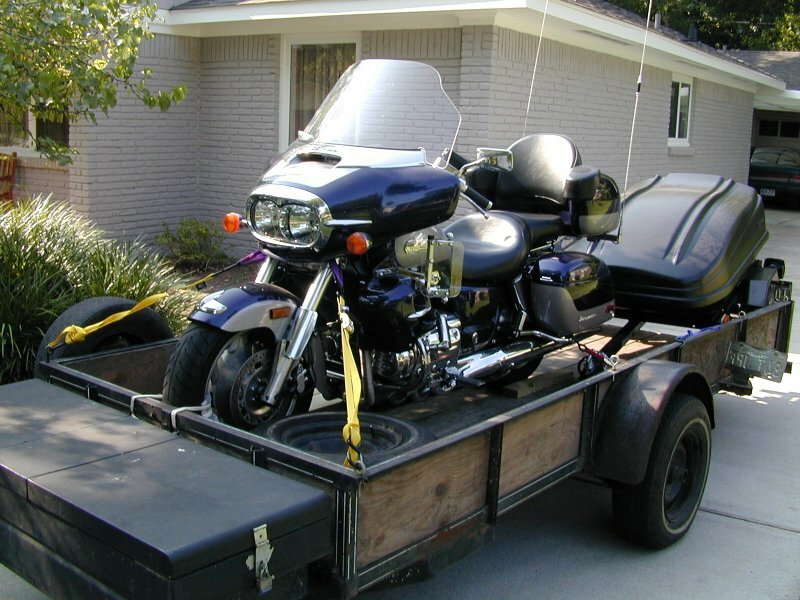 The ideal way to trailer a motorcyle is with a tire chock that securely locks the bike in an upright position, and keeps the front wheel from moving, side to side, or fore and aft. My brother solved this problem by supporting his Valk on the crash bars before tying down. He used a chainsaw to cut grooves in an old railroad tie to hold the crash bars.